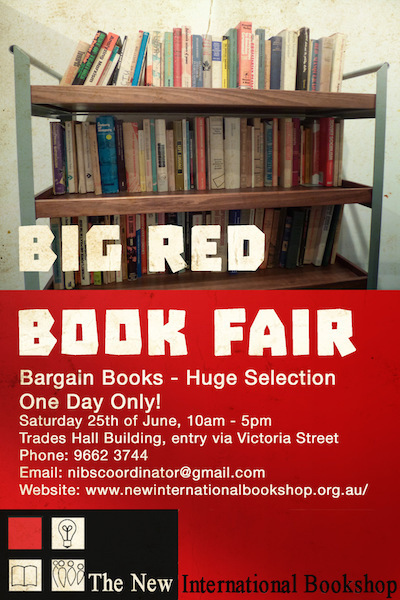 This Saturday, 25th June 2016, the annual Big Red Book Fair is returning to the Trades Hall Building. Entry is FREE and there will be heaps of cheap and high quality books of all genres on offer! The sale will run from 10am to 5pm and throughout the day book lovers can explore the Trades Hall's rooms and corridors which will be filled to the brim with speciality books on politics, history, sociology and much, much more! This is a one day only event, with proceeds going to the New International Bookshop, Melbourne's Radical Bookshop. All are welcome and a BBQ will be provided by LASNET. Don't miss this opportunity to purchase unique book titles at bargain prices. For more information and a sneak peek at the sale, please visit the official website and Facebook profile.